If you've ever seen the Evil Dead series (or the crappy, reboot movie that came out a few years ago) or read or watched anything that references Cthulhu, Dagon, the Necronomicon or countless other characters you've entered the weird world of the mythos of pulp writer Howard Phillips Lovecraft. From the legion of "Old Ones" the idea of certain cursed, ancient tomes and other themes that have leaked into the mainstream, H.P. Lovecraft has made his way into the collective consciousness via movies, music, fiction, video games, RPGs and more. A part of the reason for Lovecraft's staying power is the dedication of the Lovecraft circle, certain pulp writers inspired by his writing and the mythos he built on. By the 1970's and 1980's more and more Lovecraft literary criticism was being written, much of that material coming from the Necronomicon Press out of Rhode Island. <a href="https://necropress.com/">Necronomicon Press</a> has recently reupdated their website and now offer entire backissues of Crypt of Cthulhu in PDF form. The Crypt features some stellar literary criticism related to Lovecraft by some of the foremost Lovecraft scholars like Dr. Robert Price and S.T. Joshi. "This fall/winter offers some special projects we'll be releasing. As always, thanks for the support over the years … let's keep the tradition going! Make Cthulhu Great Again!" 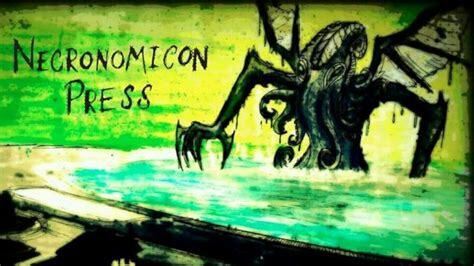 Necronomicon Press was founded in 1976 and has published hundreds of titles from zines related to Lovecraft scholarship as well as Mythos related fiction. They have been on a publishing hiatus for some time but new titles should be available soon. NecroPress received the British Fantasy Award in 1995 and the World Fantasy Award in 1994 and 1996. Lovecraft is considered by many to be as important a figure to science fiction, fantasy and horror as Edgar Allan Poe. For years the World Fantasy Award trophy bore the recluse writer's likeness until 2015 when a campaign was launched to have him dropped due to his being an "avowed racist" with "hideous opinions." S.T. Joshi and others continue to defend the legendary author's legacy from detractors. An avowed racist with hideous opinions? That describes most classic authors. That's the whole point of free speech isn't it? Duh… who the hell wants to live in a Orwellian dystopia, like mind warped drones? We need access to all opinions and perspectives!!! Live your own damn life and stay out of mine! Liberty and freedom to choose your own path. IDIOTS! !